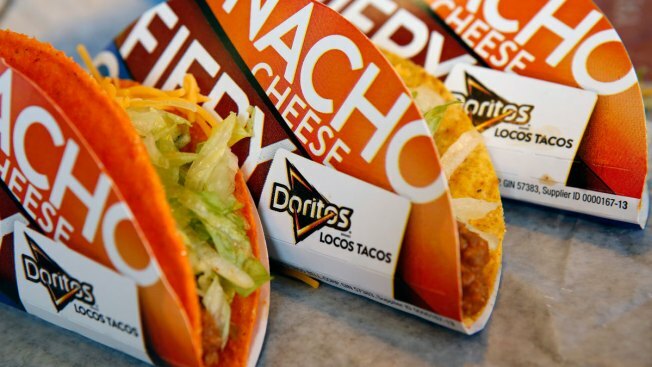 In this Oct. 4, 2013 file photo, Doritos Locos tacos. Thanks to the Golden State Warriors winning Game 3 of the NBA Finals by “stealing a road win," Taco Bell is giving away free Doritos Locos Tacos. Whether you were rooting for the Golden State Warriors or the Cleveland Cavaliers in the 2017 NBA Finals, everyone wins Tuesday with free food from Taco Bell. The taco franchise challenged the Eastern and Western Conference winners to "steal a road game" during the tournament and offered to give free Doritos Locos Tacos to everyone in return. Thanks to the Warriors' 118-113 victory over the Cavaliers in Game 3 in Cleveland, taco fans everywhere can now claim their prize. The "Steal a Game, Steal a Taco" giveaway is from 2 p.m. to 6 p.m. at Taco Bell locations nationwide, while supplies last. Customers are limited to one taco and there is no purchase necessary. Taco Bell held a similar promotion during the 2016 World Series. Golden State defeated Cleveland on Monday to win their second NBA title in the last three seasons.